Nice floral print. I bought one panel to see if it would go well with my other outdoor curtains and it seems to blend in well. Will get the other panel. Liven up your outdoor space with our Cambria 3M Scotchgard Outdoor Panel. 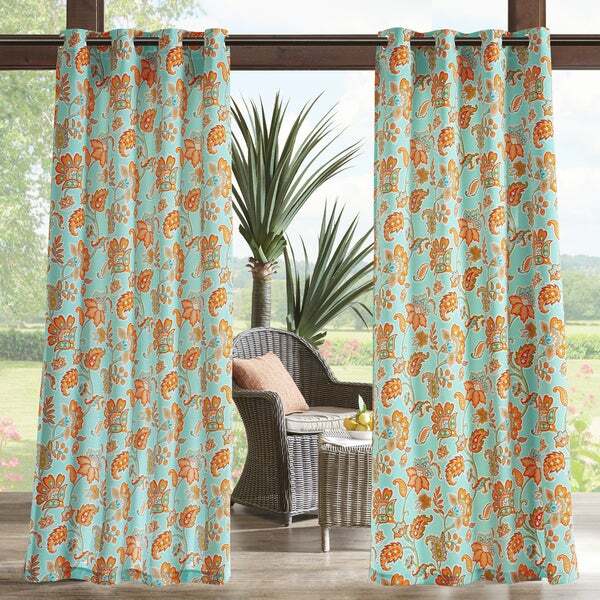 The weather resistant fabric features a vibrant floral pattern that pops against an aqua/ yellow/ blue ground and provides long-lasting durability for the whole season. The 3M Scotchgard treatment helps repel moisture, resist staining, and creates a durable water barrier that keeps these curtains drier longer. Simply hang to stylishly separate your space, enhance privacy, or filter the right amount of light for comfort. Fabric will soften after wash. I love my new curtains for my kitchen! They came so fast and look great on my bay window. The color is just like the picture and the fabric is sturdy. My only wish is that the curtains came in smaller sizes for my kitchen sink window. Great purchase and the price was so much lower than the other 2 stores where I looked! Thanks Overstock!!! Really not what I expected, color was different and it looks really cheap. "what is the width and length"
This is approximately 54 inches wide x 84 inches long. "what is the other curtain that is paired with these, i love the color combinations"